FLTK defines some constants to help the programmer to find out, for which FLTK version a program is compiled. keyboard for FL_KEYBOARD and FL_SHORTCUT events. A mouse button; use Fl_Button + n for mouse button n.
The additional key of ISO keyboards. The Kana key of JIS keyboards. The Eisu key of JIS keyboards. The Yen key of JIS keyboards. The underscore key of JIS keyboards. The print (or print-screen) key. The 'help' key on Mac keyboards. One of the keypad numbers; use FL_KP + 'n' for digit n.
The enter key on the keypad, same as Fl_KP+'\r'. The last keypad key; use to range-check keypad. One of the function keys; use FL_F + n for function key n.
The last function key; use to range-check function keys. These constants define the button numbers for FL_PUSH and FL_RELEASE events. The following constants define bits in the Fl::event_state() value. One of the shift keys is down. The caps lock is on. One of the ctrl keys is down. One of the alt keys is down. The num lock is on. One of the meta/Windows keys is down. The scroll lock is on. Mouse button 1 is pushed. Mouse button 2 is pushed. Mouse button 3 is pushed. Any mouse button is pushed. Mouse button n (n > 0) is pushed. All keys are 16 bit for now. An alias for FL_CTRL on WIN32 and X11, or FL_META on MacOS X. An alias for FL_META on WIN32 and X11, or FL_CTRL on MacOS X. This enum defines the standard box types included with FLTK. FL_NO_BOX means nothing is drawn at all, so whatever is already on the screen remains. 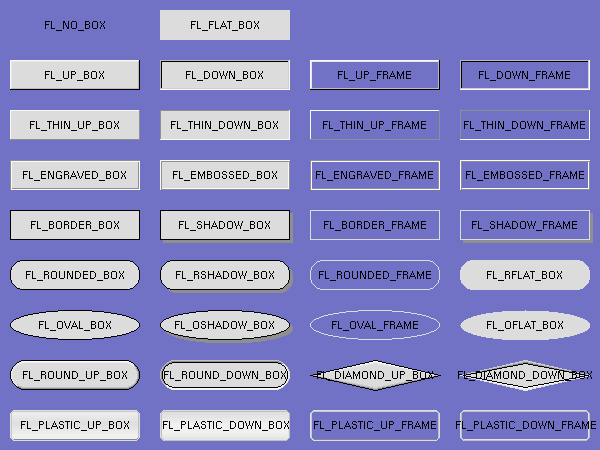 The FL_..._FRAME types only draw their edges, leaving the interior unchanged. The blue color in Figure 1 is the area that is not drawn by the frame types. Description of boxtypes is incomplete. See below for the defined enum Fl_Boxtype. Sets the current label type and return its corresponding Fl_Labeltype value. Flags to control the label alignment. This controls how the label is displayed next to or inside the widget. The default value is FL_ALIGN_CENTER (0) for most widgets, which centers the label inside the widget. FL_ALIGN_TOP_LEFT == (FL_ALIGN_TOP|FL_ALIGN_LEFT) != FL_ALIGN_LEFT_TOP. FLTK type for alignment control. Default monospaced bold screen font. The Fl_Color type holds an FLTK color value. 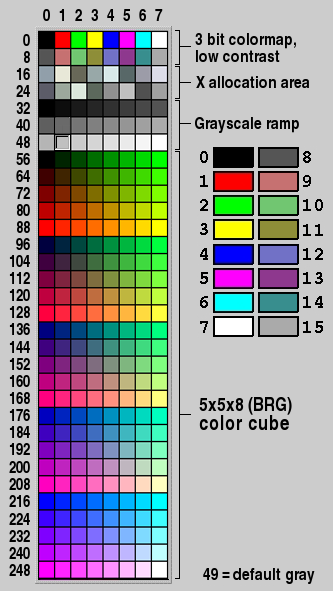 Color indices occupy the lower 8 bits of the value, while RGB colors occupy the upper 24 bits, for a byte organization of RGBI. A color can have either an index or an rgb value. Colors with rgb set and an index >0 are reserved for special use. An FLTK color value; see also Colors. Returns the inactive, dimmed version of the given color. This file contains type definitions and general enumerations. The FLTK ABI (Application Binary Interface) version number as an int. FL_ABI_VERSION is an int that describes the major, minor, and patch ABI version numbers in the same format as FL_API_VERSION. The ABI version number FL_ABI_VERSION is usually the same as the API version FL_API_VERSION with the last two digits set to '00'. Version 1.2.3 is actually stored as 10203 to allow for more than 9 minor and patch releases. The FL_MAJOR_VERSION, FL_MINOR_VERSION, and FL_PATCH_VERSION constants give the integral values for the major, minor, and patch releases respectively. To enable new ABI-breaking features in patch releases you can configure FLTK to use a higher FL_ABI_VERSION. The FLTK API version number as an int. FL_API_VERSION is an int that describes the major, minor, and patch version numbers. FL_API_VERSION is intended to replace the deprecated double FL_VERSION. The major release version of this FLTK library. The minor release version for this library. FLTK remains mostly source-code compatible between minor version changes. The patch version for this library. FLTK remains binary compatible between patches. The FLTK version number as a double. FL_VERSION is a double that describes the major, minor, and patch version numbers. Version 1.2.3 is actually stored as 1.0203 to allow for more than 9 minor and patch releases. This double version number is retained for compatibility with existing program code. New code should use int FL_API_VERSION instead. FL_VERSION is deprecated because comparisons of floating point values may fail due to rounding errors. However, there are currently no plans to remove this deprecated constant. FL_VERSION is equivalent to (double)FL_API_VERSION / 10000. A font number is an index into the internal font table. Size of a font in pixels. This is the approximate height of a font in pixels. Call the callback when there is data to be read. Call the callback when data can be written without blocking. Call the callback if an exception occurs on the file. Cursors are provided by the system when available, or bitmaps built into FLTK as a fallback. enum Fl_Cursor needs maybe an image. A child needs to be redrawn. The Fl_Scroll widget was scrolled. The overlay planes need to be redrawn. Everything needs to be redrawn. Every time a user moves the mouse pointer, clicks a button, or presses a key, an event is generated and sent to your application. Events can also come from other programs like the window manager. Events are identified by the integer argument passed to the Fl_Widget::handle() virtual method. Other information about the most recent event is stored in static locations and acquired by calling the Fl::event_*() methods. This static information remains valid until the next event is read from the window system, so it is ok to look at it outside of the handle() method. A mouse button has gone down with the mouse pointing at this widget. You can find out what button by calling Fl::event_button(). You find out the mouse position by calling Fl::event_x() and Fl::event_y(). A widget indicates that it "wants" the mouse click by returning non-zero from its Fl_Widget::handle() method. It will then become the Fl::pushed() widget and will get FL_DRAG and the matching FL_RELEASE events. If Fl_Widget::handle() returns zero then FLTK will try sending the FL_PUSH to another widget. You can find out what button by calling Fl::event_button(). In order to receive the FL_RELEASE event, the widget must return non-zero when handling FL_PUSH. The mouse has been moved to point at this widget. This can be used for highlighting feedback. If a widget wants to highlight or otherwise track the mouse, it indicates this by returning non-zero from its handle() method. It then becomes the Fl::belowmouse() widget and will receive FL_MOVE and FL_LEAVE events. The mouse has moved out of the widget. In order to receive the FL_LEAVE event, the widget must return non-zero when handling FL_ENTER. The mouse has moved with a button held down. The current button state is in Fl::event_state(). The mouse position is in Fl::event_x() and Fl::event_y(). In order to receive FL_DRAG events, the widget must return non-zero when handling FL_PUSH. This indicates an attempt to give a widget the keyboard focus. If a widget wants the focus, it should change itself to display the fact that it has the focus, and return non-zero from its handle() method. It then becomes the Fl::focus() widget and gets FL_KEYDOWN, FL_KEYUP, and FL_UNFOCUS events. The focus will change either because the window manager changed which window gets the focus, or because the user tried to navigate using tab, arrows, or other keys. You can check Fl::event_key() to figure out why it moved. For navigation it will be the key pressed and for interaction with the window manager it will be zero. This event is sent to the previous Fl::focus() widget when another widget gets the focus or the window loses focus. A key was pressed (FL_KEYDOWN) or released (FL_KEYUP). Fl_KEYBOARD is a synonym for FL_KEYDOWN. The key can be found in Fl::event_key(). The text that the key should insert can be found with Fl::event_text() and its length is in Fl::event_length(). If you use the key handle() should return 1. If you return zero then FLTK assumes you ignored the key and will then attempt to send it to a parent widget. If none of them want it, it will change the event into a FL_SHORTCUT event. To receive FL_KEYBOARD events you must also respond to the FL_FOCUS and FL_UNFOCUS events. If you are writing a text-editing widget you may also want to call the Fl::compose() function to translate individual keystrokes into non-ASCII characters. FL_KEYUP events are sent to the widget that currently has focus. This is not necessarily the same widget that received the corresponding FL_KEYDOWN event because focus may have changed between events. The user clicked the close button of a window. This event is used internally only to trigger the callback of Fl_Window derived classed. The default callback closes the window calling Fl_Window::hide(). The mouse has moved without any mouse buttons held down. This event is sent to the Fl::belowmouse() widget. In order to receive FL_MOVE events, the widget must return non-zero when handling FL_ENTER. If the Fl::focus() widget is zero or ignores an FL_KEYBOARD event then FLTK tries sending this event to every widget it can, until one of them returns non-zero. FL_SHORTCUT is first sent to the Fl::belowmouse() widget, then its parents and siblings, and eventually to every widget in the window, trying to find an object that returns non-zero. FLTK tries really hard to not to ignore any keystrokes! You can also make "global" shortcuts by using Fl::add_handler(). A global shortcut will work no matter what windows are displayed or which one has the focus. This widget is no longer active, due to Fl_Widget::deactivate() being called on it or one of its parents. Fl_Widget::active() may still be true after this, the widget is only active if Fl_Widget::active() is true on it and all its parents (use Fl_Widget::active_r() to check this). This widget is now active, due to Fl_Widget::activate() being called on it or one of its parents. This widget is no longer visible, due to Fl_Widget::hide() being called on it or one of its parents, or due to a parent window being minimized. Fl_Widget::visible() may still be true after this, but the widget is visible only if visible() is true for it and all its parents (use Fl_Widget::visible_r() to check this). This widget is visible again, due to Fl_Widget::show() being called on it or one of its parents, or due to a parent window being restored. Child Fl_Windows respond to this by actually creating the window if not done already, so if you subclass a window, be sure to pass FL_SHOW to the base class Fl_Widget::handle() method! You should get this event some time after you call Fl::paste(). The contents of Fl::event_text() is the text to insert and the number of characters is in Fl::event_length(). The Fl::selection_owner() will get this event before the selection is moved to another widget. This indicates that some other widget or program has claimed the selection. Motif programs used this to clear the selection indication. Most modern programs ignore this. The user has moved the mouse wheel. The Fl::event_dx() and Fl::event_dy() methods can be used to find the amount to scroll horizontally and vertically. A widget that is interested in receiving drag'n'drop data must return 1 to receive FL_DND_DRAG, FL_DND_LEAVE and FL_DND_RELEASE events. The mouse has been moved inside a widget while dragging data. A widget that is interested in receiving drag'n'drop data should indicate the possible drop position. The user has released the mouse button dropping data into the widget. If the widget returns 1, it will receive the data in the immediately following FL_PASTE event. The screen configuration (number, positions) was changed. Use Fl::add_handler() to be notified of this event. The fullscreen state of the window has changed. The user has made a zoom/pinch/magnification gesture. The Fl::event_dy() method can be used to find magnification amount, Fl::event_x() and Fl::event_y() are set as well. The labeltype() method sets the type of the label. These constants determine when a callback is performed. Do the callback only when the widget value changes. Do the callback whenever the user interacts with the widget. Do the callback when the button or key is released and the value changes. Do the callback when the button or key is released, even if the value doesn't change. Do the callback when the user presses the ENTER key and the value changes. Do the callback when the user presses the ENTER key, even if the value doesn't change. Get the filled version of a frame. If no filled version of a given frame exists, the behavior of this function is undefined and some random box or frame is returned. Returns a color out of the color cube. r must be in the range 0 to FL_NUM_RED (5) minus 1, g must be in the range 0 to FL_NUM_GREEN (8) minus 1, b must be in the range 0 to FL_NUM_BLUE (5) minus 1. Returns a darker version of the specified color. Get the "pressed" or "down" version of a box. If no "down" version of a given box exists, the behavior of this function is undefined and some random box or frame is returned. Get the unfilled, frame only version of a box. If no frame version of a given box exists, the behavior of this function is undefined and some random box or frame is returned. Returns a gray color value from black (i == 0) to white (i == FL_NUM_GRAY - 1). Returns a lighter version of the specified color. Returns the 24-bit color value closest to r, g, b. Returns the 24-bit color value closest to g (grayscale). Align the label at the bottom of the widget. Align the label horizontally in the middle. All parts of the label that are lager than the widget will not be drawn . If the label contains an image, draw the image or deimage in the background. If the label contains an image, draw the text to the right of the image. If the label contains an image, draw the text below the image. Draw the label inside of the widget. Align the label at the left of the widget. Inside labels appear left-justified starting at the left side of the widget, outside labels are right-justified and drawn to the left of the widget. Align the label to the right of the widget. If the label contains an image, draw the text to the left of the image. If the label contains an image, draw the text on top of the image. Align the label at the top of the widget. Inside labels appear below the top, outside labels are drawn on top of the widget. Wrap text that does not fit the width of the widget.